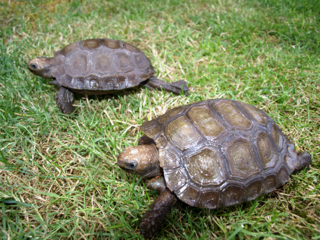 The Burmese brown mountain tortoise (Manouria emys) is the smaller of the two subspecies of mountain tortoise, Burmese blacks being the bigger sub species. Native to Myanmar, Malaysia, Thailand and Sumatra. Burmese browns are an endangered species due to habitat destruction and collection for the food and pet trade. They attain a length of 16 inches and a weight of 40 pounds. Burmese browns require UV lighting, medium temperatures (70-85F) and high humidity (80%). Their diet consists of dark, leafy greens, assorted fruit and veggies and an occasional source of animal protein. Burmese browns are extremely outgoing and make personable and feisty pets. 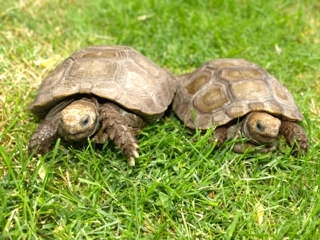 A unique feature of mountain tortoises is they build nests above ground and females guard their nests. Also known as the six legged tortoise because of very pronounced scales on their rear legs, Burmese mountain tortoises are considered the most primitive tortoises in the world.